If you’ve never created a Web application before because you didn’t have time to climb the learning curve, ASP.NET could be your big chance. This chapter shows you how to utilize everything you learned in the previous chapter about building Windows Forms applications (plus a few extra twists) in building ASP.NET Web Form Applications. It also demonstrates how to reuse the business objects created in the previous chapter by taking you step-by-step through the process of creating an ASP.NET Web Application. Microsoft made a mistake a number of years ago underestimating the tremendous impact the Internet would have on our world. After realizing the error of its ways, Microsoft responded by creating Active Server Pages (ASP)—a platform for creating, deploying, and running Web applications. Although ASP contained some interesting technologies, it definitely fell in the category of a “knee jerk” reaction. ASP allowed you to get the job done, but not in the most efficient way. In contrast, Active Server Pages.NET (ASP.NET) is a vast improvement over ASP. Rather than using scripting languages to write server-side code that is interpreted at run time, ASP.NET allows you to use fully object-oriented languages such as C# and Visual Basic .NET to create code that can be compiled and cached on the server for faster performance. ASP.NET also provides a more robust event-driven model allowing events to be raised on the client and handled on the server. In addition, Microsoft has done a great job making the Windows Forms and Web Application architecture and design tools similar enough so a developer can move from one to the other without incurring a huge learning curve. ASP.NET actually encompasses two different technologies—Web Forms and Web Services. This chapter focuses on Web Forms. To learn about Web Services, see Chapter 12, “XML Web Services”. A typical Web application is comprised of Web pages, configuration files, code files containing business object classes, images, and references to external .NET assemblies. In this walk-through, you will see how each element is used in an ASP.NET Web application. A Web application starts the first time a user requests a page from the server (for example, by entering the URL of the Web site). The application continues to run until the Web server (the physical machine) is restarted, IIS is restarted, or if any of the application’s configuration files are edited. There are a number of configuration settings where you specify different conditions for starting a new process in your Web application—percentage of memory used, number of unprocessed requests waiting in the request queue, and so on. Adjusting these settings can help make your Web applications more available and more stable. For more information, see the “Machine.config” and “Web.config” sections later in this chapter. By default, the Web is a stateless environment. If you send multiple requests from your Web browser to a particular Web site, you automatically disconnect and reconnect between each request. A series of successive requests coming from a single browser is known as a session. The first request sent from a client browser to a Web application begins a session for that client. By default (you can change this setting), if the client is idle for longer than 20 minutes, the session is automatically ended by the server. Based on this disconnected model, your Web applications need some way to keep track of all the user sessions. ASP.NET steps in the gap and keeps track of each user session automatically. It does this by generating a unique Session ID when a client sends its first request to your Web site. This Session ID is passed back to the client by means of a cookie or modified URL. For more information on sessions, check out the “The Session Object” section later in this chapter. As in Chapter 9, “Building .NET Windows Forms Applications”, you will learn about creating ASP.NET Web applications by example. In this chapter you will recreate the Windows Forms application from chapter 9 as a Web Forms application. 2. 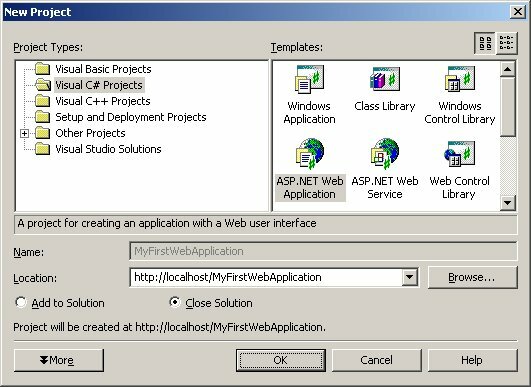 In the New Project dialog’s Project Types pane, select Visual C# to create a C# Web application or Visual Basic .NET to create a VB .NET Web application. In the Templates pane on the right, select ASP.NET Web Application. 3. Notice that the Name text box is disabled and contains the text “WebApplication1” and (if you’re creating the Web Application on your local machine) the Location text box contains the text “http://localhost/WebApplication1”. To change the name of the Web application, you must change the name of the directory in the Location text box. This is different from a Windows Forms application where you can change the name of the application and the directory independently. 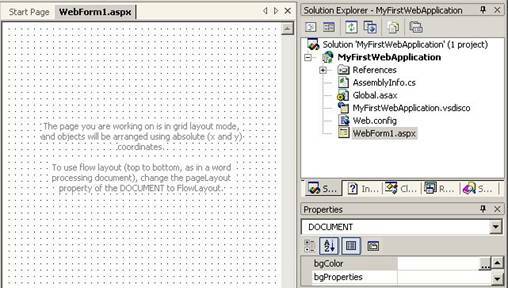 In this example, change the last part of the directory name from “WebApplication1” to “MyFirstWebApplication”. As you type this in, notice that it automatically changes the Name of the application to “MyFirstWebApplication” (Figure 1). Figure 1. The Location text box specifies the virtual root directory for your Web application. At this point, you may feel a bit like Al Gore when the “Creating the Web” dialog displays. While this dialog is displaying, VS .NET creates a new application for you using the ASP.NET Web Application template you selected. After a few moments, a new form named WebForm1.aspx is displayed in design mode in the Visual Studio .NET IDE (Figure 2). Figure 2. Visual Studio .NET creates an ASP.NET Web Application from the template you select in the New Project dialog. As you can see this is already very similar to creating a Windows Forms application—VS .NET created an application for you containing a single form. Before taking a closer look at this Web form, first you’ll do a little housekeeping and then learn a little more about what happens behind the scenes when using VS .NET to create a Web Forms application. The housekeeping involves renaming the project’s namespace. When you create a new Web application, VS .NET automatically sets your project’s namespace to the same name as the project—which is most likely not what you want! 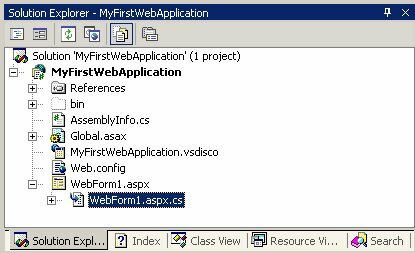 If you’re using Visual Basic .NET, before you can change the project’s namespace, you must first close the WebForm1.aspx. To do this, you can simply click the close button [X] to the right of the VS .NET IDE tabs. To change the project’s namespace, in the Solution Explorer, right-click on the project (the second node in the Solution Explorer) and select Properties from the shortcut menu, which launches the Property Pages dialog. In the left pane under the Common Properties folder, select General (if it’s not already selected). If you’re using C#, in the right pane, change the Default Namespace from “MyFirstWebApplication” to “HW.NetBook.Samples”. If you’re using VB .NET, in the right pane, change the Root namespace to “HW.NetBook.Samples”. When you’re done, click the OK button to save changes. Now you just need to change any existing references to the old name space. Select Edit | Find and Replace | Replace in Files from the main menu to launch the Replace in Files dialog. In the Find What box, enter “MyFirstWebApplication” and in the Replace with box enter “HW.NetBook.Samples” (make sure you type the case correctly if working with C#). Now click the Replace All button, which launches a Replace All warning dialog. Just click OK to ignore the warning. After clicking OK, a dialog appears telling you how many occurrences were replaced. If you’re using C#, it should say, “4 occurrence(s) replaced”. If you’re using Visual Basic .NET it should say, “2 occurrence(s) replaced”. When you created the new Web application and specified the location of the application as “http://localhost/MyFirstWebApplication” (Figure 1), you were actually specifying a virtual directory. In the world of IIS, a virtual directory is a directory on the Web server that contains a Web application. It is virtual in the sense that it does not describe the exact physical location of a directory on the machine, but provides a higher-level virtual name that, behind the scenes, is associated with a real directory. In the Location string, the “localhost” directory refers to the home directory of the Web Server. In IIS, this is set up by default to be c:\inetput\wwwroot, and therefore the MyFirstWebApplication virtual directory would be physically located in the c:\inetpub\wwwroot directory (Figure 3). Figure 3. When you create a new Web application, VS .NET creates a virtual directory that, by default, is physically located in the c:\inetpub\wwwroot directory. 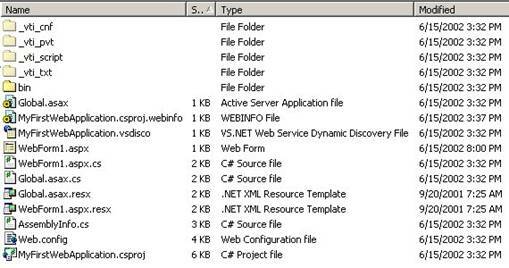 If you look in the new MyFirstWebApplication directory from within Windows Explorer, you’ll see that VS .NET has created a variety of files and subfolders in your new virtual directory (Figure 4). Figure 4. VS .NET places a variety of files in your Web application’s virtual directory. You’ll be taking a closer look at some of these files in the next section, but for now, notice there is a project file in this directory (.csproj for C# or .vbproj forVB .NET ), but no solution file (.sln). VS .NET puts the solution file in a subfolder of the “My Documents\Visual Studio Projects\” directory. In the example, it creates a subfolder named “MyFirstWebApplication” and places the MyFirstWebApplication.sln and associated .suo file in this folder. So, when you need to reopen your Web application after restarting Visual Studio .NET, you can find your solution in this folder. However, this does not mean your Web application’s source code is stored in two different places. Remember the solution is simply a container—similar to Visual FoxPro’s project (PJX) file—with links to projects and files. For now, all your source code is stored in your Web application’s virtual directory. Now look a little closer at “WebForm1” in your new Web application. A Web form can be viewed in either Design mode (Figure 2) or in HTML mode. If WebForm1 is not currently opened in the IDE, double-click on the form in the Solution Explorer. To switch to HTML mode, either click on the HTML tab at the bottom left of the Web Forms designer or right-click the Web form and select View HTML Source from the shortcut menu. As you make changes to the Web form in design mode, VS .NET automatically changes the HTML source accordingly. On the other hand, if you know something about HTML, you can manually edit the HTML source and your changes will be reflected in Design mode. If you view the HTML source of WebForm1, you will see the following HTML. This first line of code is known as a page directive. The “Page Language” attribute tells the compiler the language used for the code contained in the Web page (typically “c#” or “vb”). The “CodeBehind” setting specifies a code-behind file associated with the .aspx file—in this case either WebForm1.aspx.cs (C#) or WebForm1.aspx.vb (VB .NET). An ASP.NET Web page consists of two main parts—the visible representation stored in the .aspx file and associated code stored in a .cs or .vb code-behind file (which gets its name from “the code file behind the form”.) This structure lets you separate the user interface from the executable code. When you create a Web page in Visual Studio .NET, it automatically creates both an .aspx file and a code-behind file. It associates the two by placing the name of the code-behind file in the .aspx page directive as seen in the previous section. If you look at the list of files in the Solution Explorer, by default, you won’t see the code-behind file. To make this file visible, click on Solution Explorer’s “Show All Files” icon button, the second button from the right at the top of the window. When you click this button, a plus sign appears next to the WebForm1.aspx file. If you expand the plus sign, you will see the associated code-behind file (Figure 5). Figure 5. If you click on the “Show All Files” icon button in the Solution Explorer, you can see your Web form’s code-behind file. To view the contents of the code-behind file, double-click the file in the Solution Explorer and VS .NET opens it in the IDE. The code-behind file contains the following code-behind class definition. As you can see, VS .NET automatically added code to this code-behind file that defines a class named WebForm1 derived from the System.Web.UI.Page class. Notice the “Inherits” attribute specifies the .aspx page inherits from the WebForm1 class (belonging to the HW.NetBook.Samples namespace). When you compile your Web application under Visual Studio .NET, the .aspx file is compiled into a class derived from the code-behind class! This means you can add methods and other members to the WebForm1 code-behind class and they will be inherited by the class created from the .aspx file at runtime. You will see examples of how this works later in this chapter. Before diving further into the details of ASP.NET Web applications, you can get some immediate gratification by creating a simple “Hello .NET World!” Web page. To start, select the WebForm1.aspx file in design mode. This involves clicking the WebForm1.aspx tab and making sure the Design tab at the bottom left of the IDE is selected. Notice the text in the middle of the Web form (Figure 6) states the Web form is set to work in “grid layout” mode, and objects dropped on the form are arranged using absolute coordinates. For this example, you will change the Web form to use “flow layout”, which is more like a word processing document (you’ll use grid layout mode later in this chapter). To switch to flow layout, go to the Properties Window and change the pageLayout property to “FlowLayout”. When you do this, the dotted grid lines disappear and the text in the middle of the Web form changes accordingly. Figure 6. By default, Web forms are set to work in “grid layout” mode, but you can change their mode to “flow layout” to behave more like a word processing document. Now, drag and drop a label from the VS .NET Toolbox onto the Web form (make sure the Web Forms tab of the Toolbox is selected). The label is automatically placed in the upper left-hand corner of the form. Next, go to the Properties Window, change the (ID) property from “Label1” to “lblHelloWorld”, and then change the Text property to “Hello .NET World!”. This changes the visible text of the label on the Web form accordingly. Now change the font of the label. Click to the right of the label control on the Web form (click at the point where your mouse pointer is an “I-beam” rather than a quad-arrow) and you should see the Formatting toolbar (Figure 7). Figure 7. The Formatting toolbar allows you to change the appearance of visual elements on your Web form. Open the combo box that is set to “Normal” by default and select “Heading 1” instead as shown in Figure 7. When you do this, it increases the font size and bolds the label text. Now you’re ready to compile and run your Web application. To do this, click the Start button or press F5. When the Web application runs, you should see the text “Hello .NET World!” in large, bold letters (Figure 8). Figure 8. The obligatory Hello World application provides immediate gratification for building your first Web application. for a quick overview of the different types of controls available to you when creating Web Forms applications. controls are not processed by the Web server, but are sent directly to the client browser for rendering. If you want the lightest-weight (but least capable) controls for your Web forms, use HTML controls. HTML server controls are one step above regular HTML controls regarding capability. Although the HTML for these controls looks very similar to classic HTML controls, they have the added ability to enable server-side processing, which includes data binding and responding to events (discussed later in this chapter). These controls are designed to be most like original HTML controls, so developers who are familiar with classic HTML controls should feel very comfortable using these new ASP.NET counterparts. To use Web Forms controls on your Web pages, make sure you have the Web Forms tab selected in Visual Studio .NET’s Toolbox when you drag and drop controls on your forms. Now that you know about the different types of controls you can use in creating Web Forms, take a closer look at what’s going on behind the scenes with ASP.NET. Take a look at another file shown in the Solution Explorer—the global.asax file. When you first create a new Web Application or Web Service through Visual Studio .NET, a global.asax file is automatically placed in the root directory of your application. At run time, the global.asax file is automatically parsed and compiled by the CLR into a dynamically-generated class derived from the .NET HttpApplication base class. As its name suggests, this class represents a Web application and it’s used to process requests from users. If you right-click the global.asax file and select Open With from the shortcut menu, it displays the Open With dialog. Select “Source Code (Text) Editor” and then click the Open button. When the file opens, you will see an application directive similar to the page directive found in the WebForm1.aspx file. The “Codebehind” attribute specifies the name of the associated code-behind file, and the “Inherits” attribute specifies the class from which the global.asax file inherits—in this case HW.NetBook.Samples.Global. Right-click on global.asax in the Solution Explorer and select View Code from the shortcut menu to open the code-behind file named global.asax.cs (C#) or global.asax.vb (VB .NET). If you look at the code contained in this code-behind file, you’ll see it defines a class named Global derived from the System.Web.HttpApplication class. #Region " Component Designer Generated Code "
The first time a user requests any resource or URL within your Web application, your Web application starts and the global.asax file is parsed and compiled into a class derived from this Global class. The object instantiated from this class processes requests from the user. You place code in any of these empty event handler methods to respond to the corresponding ASP.NET events. You can also add your own custom members (such as methods, properties, fields) to this class. For example, at Application Startup you may want to call Server.MapPath to determine the current server path and store it in a static variable. This saves you from making this call over and over again (and incurring a performance hit) throughout your application. Add the following code shown in grey to your global.asax file. Now you can reference the static ServerPath property from anywhere within your Web application. For example, the following code derives a fully qualified path to a config.xml file by prepending the value stored in Global.ServerPath to the file name. Dim ConfigFile As String = Global.ServerPath + "\config.xml"
Each of these objects is detailed in the following sections. The Server object is an instance of the System.Web.HttpServerUtility class. This object has properties and methods allowing you to get and set information regarding the machine where the Web server is running as well as helper methods for processing Web requests. Here is an example of accessing the MachineName property of the Server object. Notice you simply need to type the name of the Server object followed by the property or method to access it from code. Table 1 lists some other commonly used members of the Server object. The Application object is an instance of the System.Web.HttpApplicationState class allowing you to share global data and objects across multiple sessions in an ASP.NET application. The Application object has a Contents dictionary collection property where you can add data and objects at runtime that can be accessed from any user session. Although you can specifically reference the Contents collection property to add or access items in the collection, because it has been defined as an indexer, you simply access the Contents collection by using the indexer syntax (For more information on Indexers, see Chapter 5, “Object Orientation in C# and Visual Basic. NET”). For example, add the following code shown in grey to the Application_Start method of the global.asax file. This code adds a new string object named “ConnectString” to the Contents collection. To access this string, you use a similar syntax, but you must cast the value to the appropriate type—this is because all objects stored in the collection are stored as the Object type. For example, the following code gets the value of the ConnectString item from the Application object. In a nutshell, the Application object provides an easy way to store data and objects accessible from any user session. There are a few things to watch out for when using the Application object. First of all, if you have a Web farm (a single Web site that contains multiple Web servers) or a Web garden (a single Web server machine with multiple processors), be aware that the Application object is specific to a single process running on a single processor. This means sessions running on different processors or different physical machines do not have access to the same Application object. If you need truly global access to data from all sessions running in a Web farm or Web garden, you can store the information in a globally accessible database or data file, such as an XML file. If you allow clients to modify global data stored in the Application object, you need to be aware of concurrency issues. Take for example the following code making use of a Counter value in the Application object. What happens if another session increments the Application object’s Counter value between the time this session gets the value, increments it, and stores it back to the Application object? The first session’s increment of the Counter would be lost. To prevent this, you call the Application object’s Lock and Unlock methods. The call to the Application object’s Lock method causes the Application object to lock access to any items subsequently accessed in the Contents collection. For example, once the second line of code executes, the “Counter” variable is locked to any other sessions, until the call to Application.Unlock is made. Obviously, if you lock the Application object, you want to unlock it as quickly as possible! Also beware of any “deadly embrace” problems you may encounter when you allow a piece of code to lock more than one variable. If Process A has the first variable locked and Process B has the second variable locked, they could each be waiting indefinitely for the other process to unlock the variable. Fortunately, if you don’t unlock the Application logic after locking it, the Web server unlocks the Application object when it finishes processing the .aspx file. The Session object is an instance of the System.Web.SessionState.HttpSessionState class. In the same way the Application object stores information accessible from all sessions in an application, the Session object stores session state—information accessible from all Web forms in a single user session. The unique session ID keeps each session’s data separate from all other session data. The Session object also has a Contents dictionary collection property accessible with indexer syntax. For example, the following code adds a new string object named “ISBN” that contains an ISBN number to the Contents collection. The Session object is extremely useful for storing information that needs to be passed from one page to the next in a given session. By default, Session state is stored in memory outside of the ASP.NET process. This means if the server is restarted or crashes (IIS—not the physical server), session state is not lost! For other Session state options see the “Caching data and objects” section later in this chapter. The Session object has a number of other useful properties and methods. Some of the most frequently used members are listed in Table 2. If True, specifies the session ID is embedded in the URL. If False, indicates the session ID is stored in an HTTP cookie. Returns a boolean value indicating if the session was created with the current request. Gets the current unique session ID. Clears all values from the session state. For example, the following code displays a simple “Hello .NET World” message to the client’s browser. The Response object can also redirect to another page. The following example redirects the client to the Hentzenwerke web site. Table 3 lists some other commonly used properties and methods of the Response object. Specifies whether output should be buffered (wait until the entire Response is finished processing). Specifies the number of minutes before a page cached in a browser expires. Returns a boolean value indicating if the client is still connected. Sends all buffered output to the client. Redirects a client to the specified URL. Writes the specified information to the client. The Request object is an instance of the System.Web.HttpRequest class, and one of the most important ASP.NET objects. This object allows you to read HTTP values sent from the client to the Web server. You learn a lot about the client from the properties of the Request object. For example, the following code uses the Browser property of the Request object to return an HttpBrowserCapabilities and display information about the client’s browser (Figure 9). Figure 9.You can use the Request object to find out information about a client’s browser. The User object is an instance of the System.Security.Principal.WindowsPrincipal class. You can use this object to check the Windows group membership of the current user, if the user has been authenticated. For example, the following code uses the IsInRole method of the User object to see if the user is in the Windows Group “Guests”. For more information on users and security, see Chapter 14, “.NET Security”. The Site object is an instance of the System.Security.Policy.Site class. This object can be used to determine the Web site where an assembly originates. For more information on security, see Chapter 14, “.NET Security”. If you make changes to the global.asax file while the Web application is running, ASP.NET page framework detects the change. It completes all outstanding requests, sends the Application_OnEnd event to any listeners, and restarts the application. In ASP.NET, configuration information is stored in XML configuration files. This makes remote administration a snap because you can edit these files using any standard XML parser or text editor. In addition, these files can be edited without stopping and restarting the server. Once the changes are made to the configuration files, the new settings apply to any new client requests. The Machine.config file is the root configuration file that provides default settings for the entire Web server. This file is located beneath your Web server’s Windows directory in the <Windows Directory>\Microsoft.NET\Framework\<version>\CONFIG folder. Each Web application inherits default configuration settings from the Machine.config file. more information on how this inheritance works, check out the .NET Help topic “Configuration Inheritance”. The compilation element contains a defaultLanguage setting indicating the default language of your Web application. The debug setting specifies whether you want the compiler to create debug information for your pages. This is obviously desirable when first creating and testing your Web application. However, when you’re ready to deploy a completed, well-tested application, you should set debug to “false” to generate a more compact (and faster) version of your Web application devoid of debug information. Here’s another element in Web.config named “customErrors”. · RemoteOnly – (the default) Display custom (friendly) messages to users not running on the local Web server. This setting is recommended for security purposes, so you do not display application detail information to remote clients. For more information on these and other settings, check out the .NET Help topic “ASP.NET Configuration”. Now you’re ready to create a Customers Orders Web form similar to the Windows Form created in the previous chapter. Before creating this form, remove the “Hello .NET World!” label added earlier in this chapter. To do this, right-click on the label in design mode and select Delete from the shortcut menu. Also, set the style back from “Heading1” to “Normal” by clicking on the Web form in the location where the label was then select “Normal” from the Format toolbar. Next, rename the Web form file to something more meaningful. In the Solution Explorer, right-click the WebForm1.aspx file and select Rename from the shortcut menu. Change the name of the file to CustomerOrders.aspx. Notice this also changes the name of the code-behind file (CustomerOrders.aspx.cs in C# or CustomerOrders.aspx.vb in VB .NET). Now that you’ve changed the name of the source code file, you need to change the name of the actual Web form class. To do this, double-click the code-behind file in the Solution Explorer, which opens the code file in the Visual Studio .NET IDE. Change the name of the class from “WebForm1” to “CustomerOrders”. Now it’s time to add some controls to the Web form. Make sure the CustomerOrders.aspx is open in design mode, then drag and drop a label from the VS .NET Toolbox onto the Web form. With the label control selected, go to the Properties Window and change the (ID) property to “lblCustomerID” and the Text property to “Customer ID:”. Next, drag and drop a TextBox control from the Toolbox to the Web form. The text box should be automatically placed to the right of the label. Go to the Properties Window and change the (ID) property to txtCustomerID. Before adding the next control, you need to create a new line in the Web form. To do this, click to the immediate right of the text box and press the Enter key. This should drop the cursor down beneath the Customer ID label. Drag and drop a DataGrid control from the Toolbox onto the Web form directly below the Customer ID label. 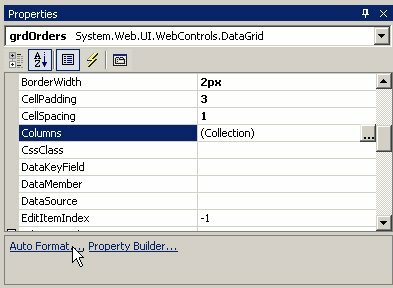 In the Properties Window, change its (ID) property to grdOrders. At this point, your Web form should look the same as the form shown in Figure 10. Figure 10. You drag and drop controls from the VS .NET toolbox onto a Web form the same way as you do with a Windows Form. If you’re not particularly fond of the default font for controls on this form, you can easily change the fonts of all controls. First, select all controls, go to the Properties Window, and expand the Font node. You can then select different font attributes. In the sample code, I’ve selected a Font Name of “Verdana” and a Font Size of “Smaller”. Next, you can improve the appearance of the DataGrid by applying an auto-format style to it. With the DataGrid selected in design mode, go to the Properties Window, and click the AutoFormat hyperlink label (Figure 11). Figure 11. Select the Auto Format hyperlink in the Properties Window to automatically apply a visual style to a DataGrid. In the Auto Format dialog, select any scheme you want, but for this example, I chose “Professional 2”. After selecting the scheme, click OK to apply the scheme to the DataGrid. Now it’s time to specify columns for the DataGrid. Click on the DataGrid in design mode and go to the Properties Window. Select the Columns property and click the ellipses button (…) next to the Columns property. This launches the grdOrders Properties dialog allowing you to add one or more columns to the DataGrid. You are going to add four columns to the grid that hold Order ID, Order Date, Ship Name, and Ship Country. First, uncheck the Create columns automatically at run time box at the top of the dialog. This prevents columns from being automatically generated from the data source at rum time. You don’t need them dynamically generated because you are going to manually specify all columns at design time. 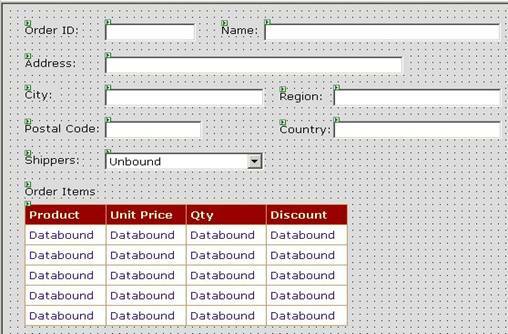 The Bound Column option creates a column bound to a data source. The Button Column option allows you to add buttons to the DataGrid that the user can click, usually to start off some process or to edit, update, or delete items in the DataGrid. The Hyperlink Column allows you to add a hyperlink label to a column that the user can click, which usually redirects them to another form where they can edit the selected item. A Template Column allows you to create a column containing any combination of HTML, text, and controls. For the first column, add a hyperlink column containing the Order ID. This allows users to click on the column to select an order to be edited. It also launches an Order Edit page and passes the ID of the selected Order to that page. To add this column, select Hyperlink Column in the Available columns list, and then click the mover button ( > ) to add the column to the Selected columns list. 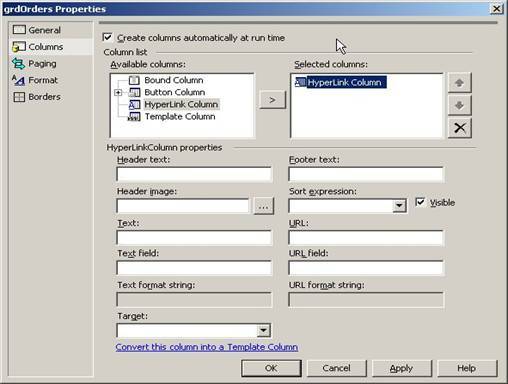 When you do this, it displays HyperLinkColumn properties at the bottom of the dialog (Figure 12). Figure 12. The Web Forms DataGrid Properties dialog allows you to add a variety of columns to your DataGrid. The value of the orderID parameter is easily retrieved from within the OrderEdit page you will soon create. Now add a bound column to the DataGrid by selecting Bound Column in the Available columns list and clicking the mover button. When you do this, a different set of properties displays in the bottom half of the dialog. 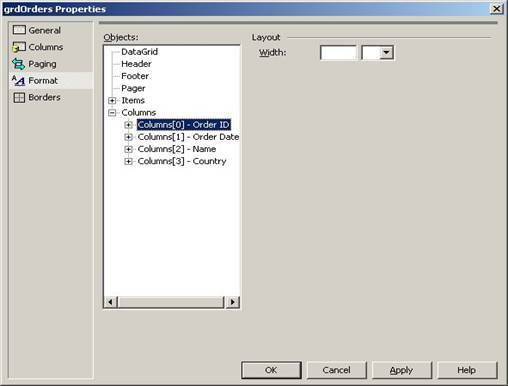 In the Header text box, enter “Order Date” and in the Data field box enter “OrderDate”. Add another bound column to the DataGrid and set its Header text to “Name” and its Data field to “ShipName”. Next, add one more bound column to the DataGrid, settings its Header text to “Country” and its Data field to “ShipCountry”. Now, set the width of each column in the DataGrid. In the left pane of the grdOrders Properties dialog, select Format. When you do this, a TreeView named Objects is displayed in the right side of the dialog. Select the Columns node and you will see the four columns you just added to the DataGrid. Select the first column (Columns) and a Width text box and associated combo box are displayed (Figure 13). Figure 13. You can set the widths of DataGrid columns in the Properties dialog. In the Width text box, enter 75 for the Order ID column. When you enter the width, a “px” (an abbreviation for “pixels”) displays in the combo box—just accept the “px” setting. Next, set the width of the Order Date column to 100, the Name column to 200, and the Country column to 100. When you’re done, click the OK button to close the dialog and apply the new column settings to your DataGrid. If you look at the CustomerOrders form in design mode, it should look like Figure 14. Figure 14. The DataGrid in design mode reflects column settings you apply in the DataGrid’s Properties dialog. Next, change the background color of the Web form to grey. Click on the Web form in design mode, go to the Properties Window, and select the bgColor property. Click the ellipses button (…) next to the property to launch the Color Picker dialog. 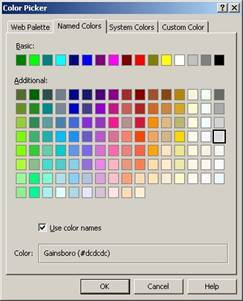 You can pick any color you like, but for this example, I selected the Named Colors tab, and selected the “Gainsboro” grey color in the far right center of the color palette (Figure 15). Click the OK button to select the color. Now you need to set up data access for the form by reusing business objects created for your Windows Forms application in the previous chapter. In Chapter 9, “Building .NET Windows Forms Applications”, you created three different business objects—Orders, OrderItem, and Shipper. You can use these same business objects in your Web Forms application. There are a few ways to accomplish this, but the easiest method right now is adding the source code files to your Web Forms application. To add these source code files, right-click your Web Forms project in the Solution Explorer and select Add | Add Existing Item from the shortcut menu. 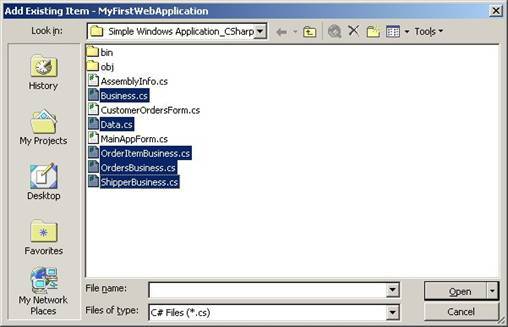 In the Add Existing Item dialog, navigate to the “Simple Windows Application” directory you created in the previous chapter, and select the five business object source code files (Figure 16). These are Business.cs, Data.cs, OrderItemBusiness.cs, OrderBusiness.cs, and ShipperBusiness.cs. If you created a Visual Basic .NET Windows Forms application, these files will have a “vb” extension rather than a “cs” extension. After selecting all five files, click the Open button. After clicking the Open button, these five files should be listed in the Solution Explorer. Typically, with business objects that are going to be used from multiple projects, you should create a separate Class Library project in Visual Studio .NET and add your business object source code files to this project. You can then compile a DLL containing just your business object classes. This DLL can then be referenced from multiple projects (such as a Windows Form application and a Web Forms application). Now you need to add code to the Web form to retrieve data from the business object that is displayed in the Orders DataGrid. To do this, edit the CustomerOrders.aspx.cs (C#) or CustomerOrders.aspx.vb (VB .NET) code file. At the top of the code file, add the following namespace reference. Go back to the CustomerOrders form in design mode and double-click the Submit button. This automatically adds an event handler to the code-behind file. Add the following code to this event handler. This code instantiates the Orders business object, calls its GetOrdersByCustomerID method, and passes the value of the Customer ID text box. It then binds the DataGrid to the resulting DataSet. Now you’re ready to test the Customer Orders Web form to see if what you’ve done so far is working properly. To do this, select Build | Build Solution from the menu. If everything compiles correctly, run the Web Forms application by pressing F5 or click the Run button (if it doesn’t compile correctly, fix the errors and compile again). When Internet Explorer opens, you should see the Customer ID label and text box as well as the Submit button (Figure 17). Figure 17. When you run the Web Forms application, it displays the Customer ID label and text box as well as the Submit button. To test the application’s data access abilities, enter the text “QUEEN” in the Customer ID text box and click the Submit button. After a few moments, you should see a list of orders displayed in the Orders DataGrid (Figure 18). At this point, if you try to click on any of the order ID hyperlink labels, you would get an error, because you haven’t created the Order Edit Web form. You’ll do this soon, but first take a closer look at what’s happening behind the scenes. 1. The browser sends a request to the Web server for the CustomerOrders.aspx page. 3. The Web page’s Page_Init event fires. 4. The Web page’s Page_Load event fires. 5. The Web server processes the page and sends HTML output back to the browser. 6. The browser renders the HTML for display to the user. Figure 19. When a client browser requests an ASP.NET Web page, the server instantiates the associated page class and generates HTML, which is sent back to the browser to be rendered. In addition to the normal HTML you would expect to see, notice there is also a hidden “input” element located in the middle of the HTML with the name “_VIEWSTATE” and a value string of seemingly incomprehensible characters. This hidden field is the mechanism used by ASP.NET to transfer page state information between the browser and the server. In the context of a Web page, “state” refers to the values of a Web page’s variables and controls. Since the Web is a stateless environment, you need some mechanism to store and retrieve the state of a page as it gets passed back and forth between the browser and the server. To understand more fully how this works, take a look at the sequence of events occurring when a user retrieves orders for a specified customer using your Web application. 1. Clicking the Submit button raises the Click event on the browser. 2. The CustomerOrders page posts back to the Web server, including the value entered by the user in the Customer ID text box. 3. In response, the Web server instantiates the CustomerOrders Web page class. 4. The Web page’s Page_Init event fires. 5. The Web page’s Page_Load event fires. 6. The event handler for the Submit button’s Click event (btnSubmit_Click) is executed to respond to the Click event raised on the browser. 7. The btnSubmit_Click event handler code instantiates the Orders business object, retrieves the Customer ID value from the text box, and passes it to the object’s GetOrdersByCustomerID method. 8. The Orders DataGrid is bound to the DataSet returned from the Orders object. 9. The Web server processes the page again and sends HTML back to the browser. Figure 20. During a round-trip, a Web form is posted to the server, processed, and sent back to the browser again. The process of sending a Web form from the browser to the Web server then back again is known as a “round trip”. If you view the source code in your browser again, this time you’ll see HTML for the DataGrid. In addition, you’ll notice the state stored in the hidden field is considerably larger than before. This is because it now contains state information for the DataGrid that was passed back from the Web server. Now we need to create an Order Edit Web form that lets users edit a selected order. In the Solution Explorer, right-click on the project node and select Add | Add Web Form from the shortcut menu to launch the Add New Item dialog with the Web Form template pre-selected. In the Name text box, change the name of the Web form to OrderEdit.aspx, and then click the Open button. This opens the new OrderEdit form in design mode. For this form, leave the pageLayout property set to “GridLayout”. This gives you a similar feel as creating Windows forms—you can position controls anywhere on the design surface. Next, go to the Properties Window and select the bgColor property. Click the ellipses button (…) next to the property to launch the Color Picker dialog. Again, as you did for the CustomerOrders form, click the Named Colors tab and select the “Gainsboro” grey color on the far right center of the palette. Now you’re ready to drop some controls on the Web form. First select the Web form in design mode. For easier placement of controls, select Format | Snap to Grid from the main menu. Next, drag and drop the controls listed in Table 4 on the form, setting their ID and Width properties as specified in the table. Note that the Size setting in Table 4 is only a suggestion—you can set the size to any value you wish. For an idea of where to locate the controls, see Figure 21. Again, if you want to change the font of all controls on this form, drag a “lasso” around the controls to select them all, go to the Properties Window, and change the Font properties to whatever you like. In the sample code, I’ve changed the Font Name to “Verdana” and the Font Size to “Smaller”. Now select a color scheme for the Order Items DataGrid. Select the DataGrid in design mode and click the AutoFormat hyperlink label at the bottom right of the Properties Windows (Figure 11). In the Auto Format dialog choose a scheme from the list and click OK to close the dialog (in the sample code, I’ve selected the “Colorful 1” scheme). Next, add columns to the Order Items DataGrid. Select the DataGrid in design mode, go to the Properties Window, and select the Columns property. Click on the ellipses (…) button next to the Columns property to launch the DataGrid Properties dialog. First, uncheck the Create columns automatically at run time checkbox, and then add four bound columns to the DataGrid as shown in Table 5. Figure 21. When you set a Web form’s pageLayout property to GridLayout, you can place controls on the form wherever you like—similar to a Windows form. Now it’s time create data access and data binding code for the Shippers DropDownList and the Order Items DataGrid controls so they can display their corresponding data at run time. Double-click the OrderEdit form design surface, which places you in the Page_Load event handler method. Before adding code to this method, go to the top of the code file and add the following namespace reference. Now go back down to the bottom of the code file and add the following code to the Page_Load Event. First this code checks the form’s IsPostBack property to determine if the page is being loaded for the first time or in response to a post back from the Web browser. If it’s being loaded in response to a post back, all of the code in this method is bypassed. This is necessary because running this code on a post back would overwrite any changes the user makes to the order. If IsPostBack is false, the code in this method retrieves the value of the orderID parameter passed to it from the CustomerOrders page. It does this by calling the ASP.NET Request object’s QueryString method, passing the name of the parameter. The QueryString method returns a string value that is converted into an integer. Next, the code instantiates the Orders object and calls its GetOrderByOrderID method, passing the order ID received from the Customer Orders page. Notice after retrieving the DataSet from the Orders object, it persists the DataSet to the Session object. This is done because later in this particular example you are going to update the selected order stored in the DataSet. Storing the DataSet in the Session state allows you to retrieve the DataSet from the Session object when the update is performed. If you didn’t persist the DataSet, you would lose all of your changes when the form is posted back to the Web site. Here’s a special note about binding to a DropDownList control. If you want to pre-select an item in the DropDownList control, the only way you can do this is by setting its SelectedIndex property. However, when you bind to a DataSet, there’s no straightforward way to retrieve the index of the DataRow you want selected. That’s why there’s a “for each” loop in this method—it loops through the DataRows to find the index of the Shipper DataRow whose Shipper ID field contains the same value as the Order’s ShipVia field. It would be much better if Microsoft came up with an easier way to do this—perhaps by means of a SelectedValue property. Here’s another important point—typically, in a Web forms application, if you need to retrieve data from the back end for read-only purposes, you can use a DataReader and Data Command object rather than a DataSet, since a DataReader provides faster (though read-only) access to data. This means any place in the application where I require read-only data (as in the case of Shippers) then I would use a DataReader rather than a DataSet. For more information on using a DataReader, see Chapter 7, “Data Access with ADO.NET”. Now it’s time to test your work on the Order Edit form so far. Compile and run the Web application by pressing the Start button or pressing F5. The Customer Orders Web form appears first. Enter the word “QUICK” in the Customer ID text box and click Submit. This fills the Orders DataGrid with all orders for the specified customer. Click on any hyperlink label in the Order ID column to display the Order Edit form (Figure 22). Figure 22. The Order Edit Web form knows the order to display based on the orderID parameter passed to it from the Customer Orders page. If you take a close look at Internet Explorer’s Address box at the top of Figure 22, you’ll see a string “?orderID=10285” at the end of the URL. This is the order ID selected in the Customer Orders form. This parameter is passed to the Order Edit form when you click on the hyperlink label in the first column of the Order Items DataGrid. This value is also used in the Order Edit page to retrieve data from the Orders and OrderItem business objects. 1. A request is sent to the Web Server for the OrderEdit Web page. In this request, an orderID parameter is passed containing the selected order ID. 2. The Web server receives the request and instantiates the OrderEdit Web page class. 4. The Web page’s Page_Load event fires. Within this event, a check is performed to determine if the page is being loaded for the first time or in response to a post back. In this case, it’s the first time the page is loaded, so the Orders business object is instantiated, a DataSet containing the order returns from the Orders object, and the Web server controls are bound to the DataSet. 5. All order items are retrieved from the Order Items business object and the Order Items DataGrid is bound to this DataSet. 6. The Web server processes the page and sends HTML output back to the browser. 7. The browser renders the HTML for display to the user. Figure 23. The diagram shows the flow of events when a user clicks on an Order in the CustomerOrders form. Again, if you want to see what was sent back to the browser, select View | Source from the Internet Explorer menu. Now it’s time to add updating capabilities to the Order Edit Web page. Start by adding a button to the form. In the sample code, I’ve added it directly below the Country text box. Set the button’s (ID) property to “btnUpdate” and its Text to “Update”. Next, double-click the new Update button. This adds an event handler method named btnUpdate_Click to the Web form. Add the following code to this method. This code retrieves the Order DataSet you persisted to the Session object earlier. Next, it retrieves values from the Web server controls and stores them in the Order DataSet. It then passes the DataSet to the Orders business object’s SaveDataSet method. Afterwards, it passes control back to the Customer Orders form. To test the Web application’s new updating capabilities, compile and run the application by clicking the Run button or pressing F5. In the Customer Orders form, enter a Customer ID and click the Submit button to display all orders for the customer. Next, select an order from the Orders DataGrid, which takes you to the Order Edit page. In this page, change one or more of the values at the top of the form (i.e. the “Region”), and click the Update button. After the record is updated, control should be transferred back to the Customer Orders page. 1. The user clicks on the Update button, raising the Click event on the browser. 2. The OrderEdit page is posted back to the Web server, including all values entered in any of the Web server controls. 3. In response, the Web server instantiates the OrderEdit Web page class. 6. The event handler for the Update button’s Click event (btnUpdate_Click) is executed to respond to the Click event raised on the browser. 7. The btnUpdate_Click event handler code retrieves the Orders DataSet (that was stored earlier) from the Session object. 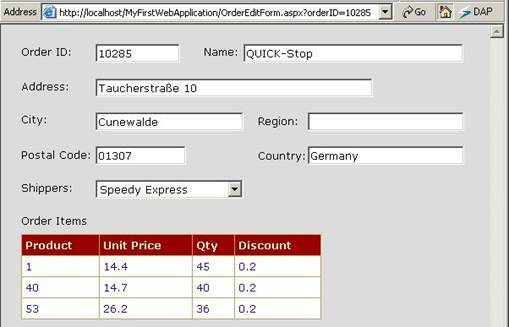 It then updates the DataSet from the Web server controls and uses the Orders business object to save the DataSet. 8. The code in the btnUpdate_Click method redirects to the CustomerOrders page. 9. The Web server responds to the redirection and instantiates the CustomerOrders page class. It goes through the normal instantiation process, and then the Web server processes the page and generates HTML to send back to the client browser. Figure 24. The diagram shows the flow of events when the user clicks the update button on the OrderEdit form. In this example, you persisted the DataSet to the ASP.NET Session object. There are actually a variety of ways to cache data and objects in an ASP.NET application. The following sections describe some of these options. for each user session. On the plus side, the Session object works well in Web farm and Web garden architectures. For more information on ASP.NET session state, see the .NET Help topic “Session State”. · InProc - In the local memory on the Web server (the default). Use this setting if your Web application has low traffic. Although this option performs the fastest because it’s stored in the memory of the same process as the worker process, it consumes computer memory and with high traffic could bog down your server. In addition, if you use this setting and you scale to a Web farm, you’ll need to do some extra work to make sure each user gets directed to the proper server within the farm that stores their Session data. · StateServer - The memory of a remote server. This setting allows you to easily scale your application to a Web farm because it stores Session objects in the memory of a computer than can be accessed by all servers in the farm. However, since the session information is still stored in memory, you can again run into problems if you get high traffic on your Web site and the Session data consumes a large chunk of memory. · SqlServer - In a SQL Server database. This is the best setting to ensure the highest scalability. This solution is scaleable because it doesn’t consume memory—Session objects are stored in a SQL Server database. In addition, it’s usable in a Web farm, because all servers in the farm have access to the SQL Server database. The stateConnectionString attribute specifies the server name and port where session state is stored when the mode attribute is set to “StateServer”. The sqlConnectionString attribute is used to specify the connection string for SQL Server when the mode attribute is set to “SqlServer”. The cookieless attribute lets you specify if cookies are used to maintain session state. If set to true, the session state is maintained by modifying URLs with an ID uniquely identifying the session rather than using cookies. The Application object stores data and objects viewable from all user sessions. However, the Application Object does not work with Web farms. So, if creating the most scaleable Web application is high on your needs list, you should avoid storing state in the Application object to avoid reworking your application in the future. The ASP.NET Cache object is visible across sessions (as is the Application object). It has the added ability of letting you associate duration, priority, and decay factors for any items you store in it. These settings allow the Cache object to limit the impact of cache data on the server’s memory. When memory begins to fill up with cached data, the Cache object purges data based on its priority and how recently it was used. One drawback of the Cache object is it does not work with Web farms. Rather than using the Session object, you can create a custom Web Service for caching. This has an advantage over the Session object in being accessible outside the confines of IIS. Another caching option allowing you to reduce the memory demands of your Web server is storing information on the server in session-specific XML files. You identify XML files with a particular session by using the Session ID. The Session ID is a unique, random string generated for each session. You retrieve this string from the Session object’s SessionID property (Session.SessionID). When I was writing this chapter, I had the unfortunate experience of having my computer reboot while I was working with Visual Studio .NET on the sample Web application. This reboot caused IIS to cease functioning because it corrupted a key file—MetaBase.bin. The MetaBase.bin file stores a variety of configuration settings on versions of IIS prior to 6.0 (where it has been replaced by XML files). If you’re working with a version of IIS that uses the MetaBase.bin file, you can save yourself some headaches by making a backup of this file using the Internet Services Manager (In Windows XP, it’s called Internet Information Services). You launch it from Control Panel’s Administrative Tools or in Windows 2000, from the Start | Programs | Administrative Tools | Internet Services Manager menu. If you’re using Windows 2000, once the Internet Services Manager dialog appears, right-click on the server node and select Backup/Restore Configuration from the shortcut menu (Figure 25). 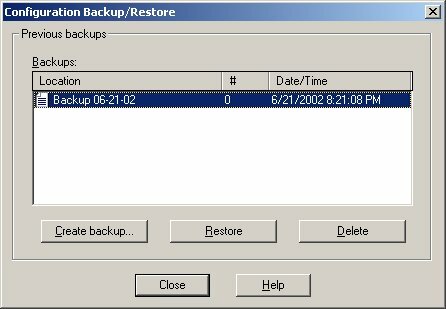 If you’re using Windows XP, you need to select the All Tasks option to see the Backup/Restore Configuration option. Figure 25. Making a backup of your MetaBase.bin file on versions of IIS prior to 6.0 helps you recover from accidental reboots of your Web server machine. 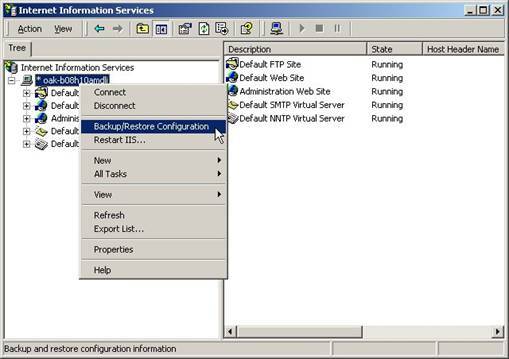 When you select this option, the Configuration Backup/Restore dialog appears (Figure 26). If you previously created any configuration backups, these appear in the Backups list. You can choose to Delete a backup, Restore a backup (you’d do this to recover from a fatal crash), or create a new backup. Figure 26. The Configuration Backup/Restore dialog allows you to create new backups, restore backups, or delete backups of your MetaBase.bin file. If you click the Create backup… button, it prompts you for a Configuration backup name. Just enter a descriptive name, click the OK button, and it automatically creates a backup of your MetaBase.bin file. Microsoft’s .NET team has done a great job in bringing Web development to the masses, providing an environment that makes it easy to create event-driven Web Forms applications. If you create business objects for your .NET applications, you don’t have to duplicate your application logic when building both a Windows Forms and Web Forms application—most of the work is done once in building business objects either type of application can use. However, Web Forms is only half of ASP.NET—Chapter 12 introduces you to the other half—“XML Web Services”.